Way back in 2004 during the first week of April I spent the day fishing Jackson Lake with Mike York, checking out the bass fishing for a June Georgia Outdoor News article. We fished all day and caught a lot of small bass, never hooking the bigger fish we hoped to catch. Mike works for the Butts County Sheriff’s Department and fishes with the Butts Bass Busters bass club. He made the state team last year and finished 24th this year at the Top Six. There are several professional trails that he fishes, too, like the Everstart and BFL trails. Fishing at Jackson was really enjoyable during the week. Missing were all the skiers, skidoos and cruisers that usually make you rock and roll while fishing there on the weekend. It was peaceful and calm most of the day. The water was unusually clear for this time of year and we watched many small bass come up and look at Trick worms and top water plugs early in the morning. A few of them hit. 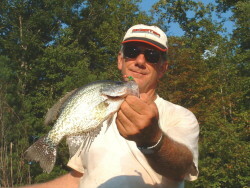 Our best luck was fishing Carolina rigged Trick worms on main lake and river points. On one point in the South River I landed three bass on three casts, then broke off. While I was tying on a new Carolina rig, Mike landed four bass. That was our best spot by far. We started out the morning looking for bedding bass, and saw some new beds but did not see any bass on them. The cloudy sky and low light made it difficult to see very deep, even in the clear water. Mike had gotten reports that a good many bass were bedding right now, unusually late this year. I was impressed with Mike’s knowledge of Jackson Lake and bass fishing. He says bass fishing will get better for the next several weeks as bass move onto their summer holes and stack up on points. He likes to catch them on crankbaits and Carolina rigs, and summer is his favorite time of year for fishing that pattern. If you get a chance, head to Jackson and check out the points for bass. This entry was posted in Bass Fishing, How To Fish, Where To Fish on April 10, 2019 by ronniegarrison.